But my mind told me to get my life together first. My room was in desperate need of a deep cleaning and we all know that a clean space leads to a clutter free mind. So I chose the smart thing, an outfit post can wait til tomorrow. Anywho, I did get a chance to take pics at a school function I just attended. 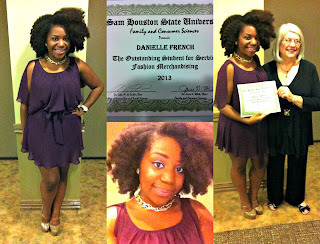 My department (Family and Consumer Sciences) had a reception for graduating seniors and outstanding students. I was recognized in service and as a graduating senior. After all the years and hard work, I can finally see the big picture. And in the words of the A Team's John "Hannibal" Smith, I love it when a plan comes together.